ALSO: Los Angeles Kings defenseman Willie Mitchell is expected to be in lineup at Denver tonight to face Avalanche. Details and audio below. some heads at the Los Angeles Kings' 2013-14 Training Camp. Fast forward to September 17, when the Kings skated at Anaheim in their third pre-season contest of the 2013-14 season, and once again, many were asking that same question. Indeed, “that guy” deftly split two defenders to skate in on a breakaway against the Coyotes, and “that guy” scored a nifty goal off the rush at Anaheim. “That guy” was none other than forward prospect Scott Sabourin, a 21-year-old, 6-3, 203-pound native of Orleans, Ontario. Sabourin is an unknown to the vast majority who follow the Kings because he is not a Kings prospect. In fact, he was signed as a free agent by the Manchester Monarchs of the American Hockey League (Kings’ primary minor league affiliate), not the Kings. 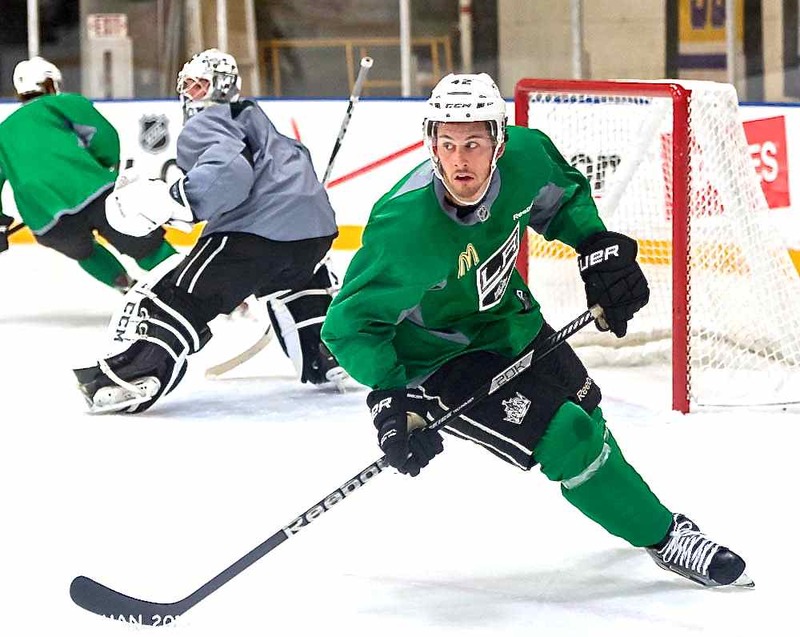 But Sabourin, who signed with the Monarchs very late in the 2012-13 season, is in the Kings’ 2013 Training Camp, and, as the descriptions of his play might indicate, he has been quite the surprise so far. Sabourin played in five regular season games for the Monarchs last season, recording one assist, with a +1 plus/minus rating, and four penalty minutes. In the AHL playoffs, he did not get on the scoresheet in three games. What has been surprising about Sabourin is that everyone knew that he was a physical player, and that he scored thirty goals last season with the Oshawa Generals of the Ontario Hockey League. 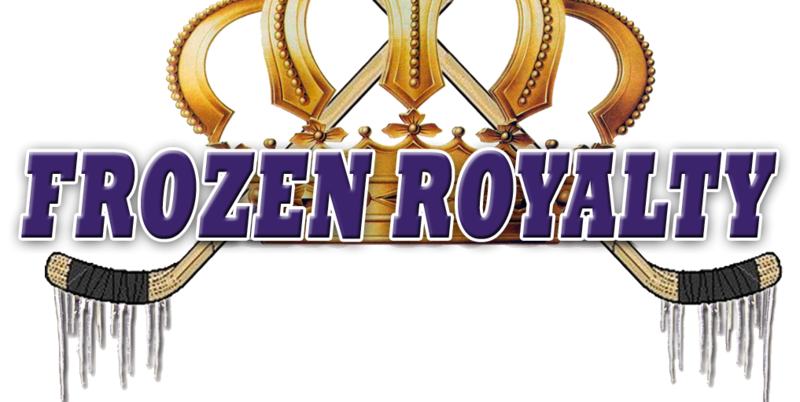 But no one expected to see the skating ability and skill he has shown in the Kings’ training camp. For his part, Sabourin is just soaking everything in during his first National Hockey League training camp. Although Sabourin is not a highly-skilled sniper or playmaker, he appears to have abilities in several different areas. Despite a good showing so far in training camp, Sabourin knows his game still needs work. “They haven’t said too much, but I think they like me,” he added. Like just about all players coming out of major junior hockey in Canada, for Sabourin, the speed and quickness of the game at the NHL, and even the AHL levels, took some getting used to. But at the same time, some things are a bit easier, simply because the players are better and more experienced. Although he has certainly turned some heads during training camp, Sabourin, as reported earlier, is under contract to the Monarchs, not the Kings. As such, he cannot be considered to be an NHL prospect at this time. In fact, he has a lot left to prove before he can even think about earning an entry-level NHL contract. Indeed, Sabourin has a very long way to go before his dreams of playing in the NHL might be fulfilled. But he is not letting that get him down. As reported by Frozen Royalty on Twitter just seconds after he said it, veteran defenseman Willie Mitchell, who missed last season due to two surgical procedures on his knee, said that he will be in the lineup tonight when the Kings skate at Colorado in a pre-season contest. For Mitchell, the game will be his first in nearly 15 months. Sutter will be watching Mitchell closely. Sutter also emphasized the importance of Mitchell being back with his teammates. Game action or not, Mitchell is still working to get up to speed.